Mix all the ingredients, until the dough sticks together. Form into roughly, Plymouth rock shaped (1 to 1 1/2 inch) balls. This recipe makes about 8 cookies. The actual picture of Plymouth rock, at the top of this post, is from Wikipedia, but Google images is loaded with photos of the rock, from all different angles, to use as a guide. Use a toothpick to "engrave" each cookie with the date - 1620. Most photos show a rectangle around the date, so I added one by pressing the handle from a lemon zester (or maybe it's a spice grater), into the dough. Bake on a greased cookie sheet for 7 to 8 minutes, at 375 degrees Fahrenheit, until they begin to brown. Remove from the oven, and cool completely. Drizzle with a thin, gray tinted, powdered sugar, and milk glaze. Start with 1/4 cup of powdered sugar, 1 tablespoon of milk, 1 drop of black food coloring, and one drop of green. Then adjust, adding more milk, or sugar, until you have a nice drizzling consistency. Allow the cookies to sit for an hour, or so, until the glaze has hardened. Don't worry if they're not perfect. After all, there's a good deal of doubt, that the Pilgrims even landed there, despite what we learned from School House Rock (click here, to view the song on YouTube). 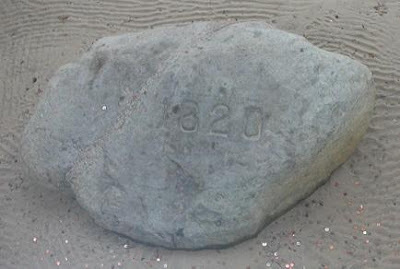 I'd suggest checking out American Beginnings: The Truth About Plymouth Rock with Rick Shenkman, instead (click here, to view it on How Stuff Works). For more fun with geography, or history, check out this week's Geography, and History link-up at Children Grow, Children Explore, Children Learn. They look amazingly like the real one. Good symbol in any case. Very cute project. Did they taste good? I was going to ask how you turned it gray,and then I got to the frosting part. Fun way to incorporate that. Oh my word, those a disgustingly, intriguingly realistic! I must say, your gray icing reminds me of the "Bleeding Armadillo Cake" from the wedding reception in "Steel Magnolias"...funny! Wonder Mom - The kids weren't too sure about it at first, either. Then, D licked the "rock" on his plate, declared it sweet, and yummy, and the rest of them quickly overcame their repulsion. Now, hopefully, the younger ones won't be tempted to sample the rocks in the backyard. I love this idea so much! Thanks for the recipe and fabulous idea, I'll be linking. Great idea! I'm going to do these this month with my own homeschooled kiddos. Thanks so much for sharing! These look great! Thank you for linking up this week. You are so awesomely creative! I agree with phasejumper. Thank you for sharing. I love these! I'm featuring them in my Friday Favorites tomorrow! We're studying Jesus, the Rock, right now. I think I will borrow your idea and use it for that. Thank you for being so creative! I'll post some pictures probably next week to my blog. I hope you drop by and see what you inspired.